Shwings and Things, Inc. was founded in 2012 in Hollywood, CA by a father and son team whose mission is to share the fun in life with cool, affordable accessories. Shwings lets you dress your shoes up by adding wings in all sorts of patterns and shades to add that extra edge to your tennis shoes. Shwings shoe wings first product was a wing accessory. In 2014 the team acquired a license for My Little Pony and also launched two new product lines, Linx — a rubber band shoe accessory that turns lace up shoes into slip-ons and Stickcons — a fast and easy way to bling your shoes. 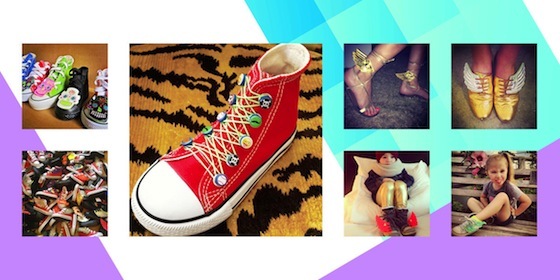 Now who wouldn’t want to bling out their shoe with the hottest new accessories for your feet! Shop Shwings Online Here or Find out how you could carry Shwings in your boutique here! In Los Angeles Shwings is available at Nordstrom, Kitson, Fred Segal and Sportie LA as well as internationally at Colette, Galeries Lafayette and Le Bon Marché in Paris.